Notable alleged blown calls: Royals-Astros, June 17, 2010; Nationals-Reds, April 15, 2012. Claim to fame: Was the left field umpire at Wrigley Field on October 14, 2003. That's right: Game 6 of the NLCS. Moises Alou pleaded with Everitt to call fan interference after he and Steve Bartman reached for the same foul ball, but Everitt declined. The Marlins won the game and, eventually, the series. How Has Steve Bartman Avoided Showing Up On The Internet After All These Years? Everitt's R/9, BB/9, and K/9 had all been rising since 2007, but in 2010 they went down. In the case of his R/9 and BB/9, he was just joining the larger trend ... but the drop in K/9 bucked the trend. ... 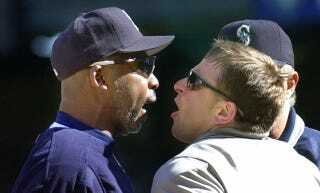 While establishing himself in 2000, he led the major leagues with 13 ejections. He hasn't had a year like that since, but his ejection rate remains higher than average. There is a specific, inescapable horror in umpires these days. You never know when the next screwy mindfuck of a call is going to come, and if it can happen to a guy with as much skill as Mike Everitt, it can happen to anybody. Sample PITCHf/x strike zone: May 15, 2011. NESN called Everitt's Sunday Night Baseball strike zone "questionable at best," even as the Red Sox pulled off a sweep of the Yankees last May. True fact: Was a two-time All-State trumpet player in high school and is a "political enthusiast" who "enjoys watching viewpoint programs." The ball was in the stands. It was clear. I just zeroed in on the ball, and it was an easy call.